You’ve got the ring, the date, and the perfect groom. Now you just have to find the perfect dress. Whether you’ve watched every episode of Say Yes to the Dress and think you know exactly what you want or have absolutely no idea, wedding dress shopping is a treat. 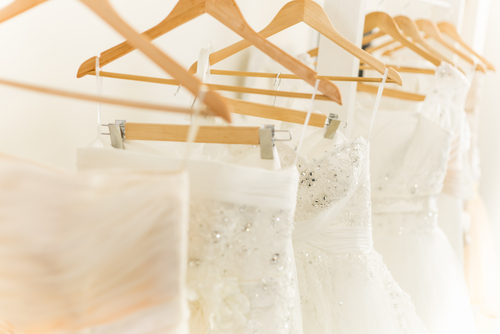 Check out the following stores below to guide your perfect dress wedding search right in Indianapolis. Alfred Angelo accommodates walk-ins if they have fitting rooms and consultants available. They carry wedding dresses sized from 0-30W and have a 15% discount with a valid military ID. Their Dream in Color collection allows you to add a splash of color with a palette of 60 shades to your dress that will perfectly match your wedding party. David’s Bridal offers dresses in sizes 0-26W, free shipping on sale dresses, and discounted bridesmaid dresses (when the bride purchases her dress there). They currently house Vera Wang’s White collection. Appointments are helpful, particularly on weekends. They boast that they have wedding dresses for every bride, regardless of budget. This family-owned boutique has been serving brides for more than 20 years. They have more than 300 gowns in stock, including exclusive designer collections, ranging from $450-$4,000. Appointments are not required, but they are strongly recommended. Family owned and operated, Posie Patch has been in business for more than 30 years. The bridal superstore exclusively offers dresses from Allure Bridals, Casablanca Bridals, and Maggie Sottero. If you visit during their Semi-Annual Sample Sale, you can get a dress for 40% off. The Perfect Stitch offers custom-made gowns by their two expert seamstresses. They are also a bridal consignment, so if you’re on a shoestring budget, you might consider purchasing a previously worn gown. In the event that it’s not your size, they can do your alterations right there at the store. Visit a few stores, try on a few gowns, and eventually you will say yes to your dress!